From La Sabina we develop and collaborate on various conservation initiatives with the conviction that our photographic guidance activities are closely related with them. We think that conservation and photography are mutually self-rewarding: if we can not maintain spaces and wildlife that it is difficult for us to photograph them, while photography of this heritage is a great tool to make it known. 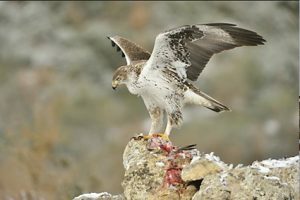 Bonelli’s eagle is one of the most threatened raptors in Catalonia with a population of about 65 pairs. 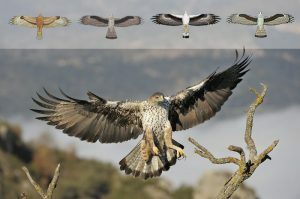 In a pilot project to photograph and protect this species, from La Sabina and in collaboration with the Catalan Government (Departament de Territori I Sostenibilitat from the Generalitat de Catalunya) we have detected negative impacts on the pair of Bonelli’s eagle in the area, consequently, we have developed correcting measures to minimize these impacts. We have come to agreements with hunters from the area to exclude from hunting zone the nesting area, with the bishopric in order to ban dire-crackers during weddings and other events in a hermitage near nesting area, a breeding success monitoring is carried out as well and a feeding point has been installed. All these actions have turned out to be very effective. After years of breeding failure, from 2012 the average of chicks has increased from 0 (before) to 1,3 chicks per year, being the Catalan average 0,7-0,8 chicks / year. During the year 2019 we will extend our conservation actions to the entire province of Lleida with funding from the Biodiversity Foundation (Ministry for Ecological Transition) and the support of the Department of Territory and Sustainability (Generalitat de Catalunya). The project aims to consolidate and expand the actions carried out in the pilot project of Photography and Conservation, export the model to another nearby couple and carry out detailed studies on couples throughout the province for their future management through land stewardship agreements and others. In Lleida there are 8-9 couples that represent the bordering pairs of both the littoral and pre-coastal population of southern Catalonia (province of Tarragona) and of the Ebro Bassin - Pepyrenees (province of Huesca). The importance of the conservation of these pairs lies above all in the buffer effect for the nucleus of the population and the "spearhead" for the expansion of the species. 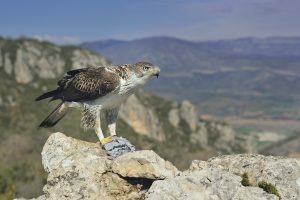 We have already begun to execute the first measures to improve the habitat in the conservation project for the Bonelli's eagle in Lleida. These are actions that we expect to be expanding and continuing over time with long-term results. 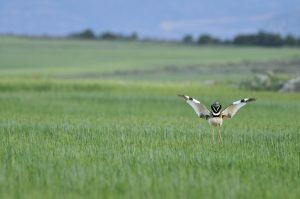 We have worked and planted with old fields cereal for more than 30 years that were abandoned and covered with scrubs so they can feed spices-prey like partridges and rabbits. 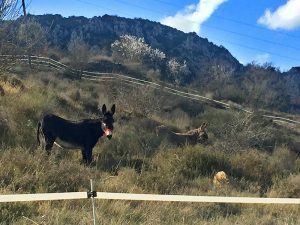 With the same purpose we have two donkeys (we could soon get more) grazing part of the hunting area of the eagles, near Montsonís, in order to open the vegetation and improve the habitat. 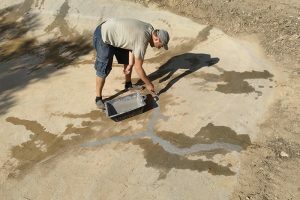 We have also fixed a pool that should serve as a trough for wildlife, also connecting tanks that allow to maintain the level of water throughout the year. 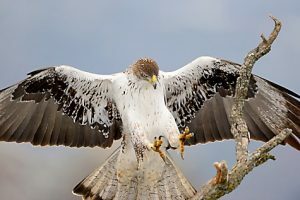 The Bonelli's eagle is a threatened species that is subject to important monitoring and conservation efforts, and the Montsonís project is bringing its grain of sand with a clear improvement in its reproductive success. On the other hand, thanks to the continuity of the photographs, it can be tracked over time, providing data on individuals and plumage changes to detect changes that might otherwise be unnoticed (a study of their plumage is also underway). That is why the photographs that allow to visualize these changes over time are very helpful. If you have been with us photographing these Bonelli's eagles, we call your collaboration, providing photos where body plumage and wings open on the lower side are clearly seen. If you want to collaborate, you can send us photos in a position similar to the photos above (important to indicate the date and the author). In no case will the photographs be made public and in case there was an interest in including any of these photographs in a publication on plumages, we would ask for the relevant authorization beforehand. We are a land stewardship body and as such we have agreements with different land owners and local institutions in order to manage some land for species conservation and photography. This way we can carry out our activity, at the same time that we favour the wildlife and the land owner can get some benefits from it. The abandonment of extensive livestock has long since led to the loss of pools where the herds were to drink. 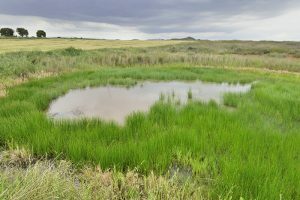 Many of these ponds were vital to wildlife that found places to reproduce (case of amphibians and invertebrates) or places where to go to drink and cool off on the hottest days of summer (birds and mammals) . 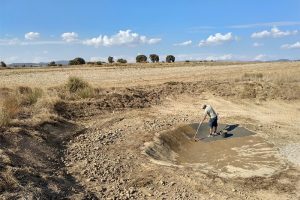 With the partial financing of the Biodiversity Foundation and the support of the Balaguer Town Hall, we have started together with the Societat Catalana d'Herpetologia a project to recover five of these ponds in the drylands of La Noguera, near where we have some of our photographic hides. A small return in form of habitat improvement to these hard and arid environments, but also so surprising. 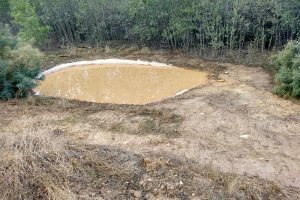 After an extremely rainy spring and some last-minute "impediments", in July a couple of black-billed sandgrouses nests a mere 250 m from one of the pools - finally we have been able to start the restoration work . The bucket of those with losses has been impermeable, the water catchment by surface runoff has been improved and access to those that could be used by birds has been facilitated, reducing the slopes and eliminating the excess of vegetation at some points. 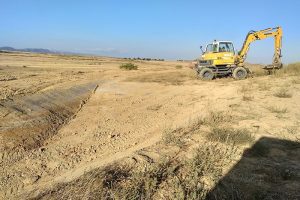 In a riverside forest of the Farfanya River a new pond for amphibians has been dug up to the water table. 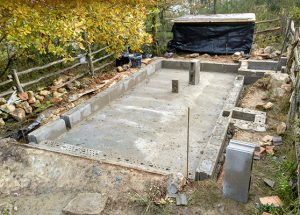 Before continuing with the work we will have to wait for the autumn storms to settle the work of this first phase and continue with the project. 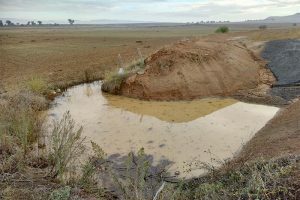 Autumn rains have begun to fill the ponds. At the moment they look somewhat undeveloped. We hope the materials will be seated, the sediments are assessed to evaluate this first phase and decide the relevant actions for next winter and the beginning of spring next year. At the end of February, we cleared the Pouets pond, at the departure of La Portella. 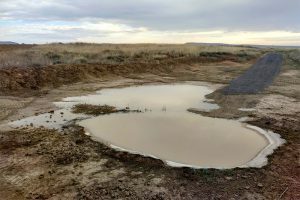 It is an interesting digged pond on the rock of about 35-40 m3 that collects the rain water of about 1500 m2 through well-picked pipes on the stone. The cleaning has been done with volunteers and students from the agronomy and forestry school of the University of Lleida. After having done this action, we have been able to count three common frog into the pound. Lesser kestrel disappeared from Catalonia in the mid-80s due to the habitat transformation mainly for agriculture intensification (change to irrigation, pesticide use, missing old buildings to nest…). 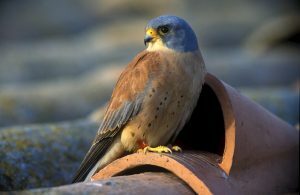 From early 90s and thanks to a long captive breeding project and reintroduction, lesser kestrel recovered it population and currently there are about 160 couples in Catalonia. Among others, it has been fundamental for this recuperation habilitating old buildings or new constructions so lesser kestrel can nest. 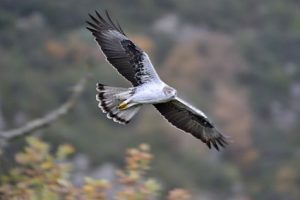 Montagu’s harrier is a summer breeding species very localised and scarce in Catalonia. It nearly disappeared here, where it went down to 2 breeding pairs. From the Catalan government a campaign was started in 1986 in order to locate and protect nests in cereal fields. 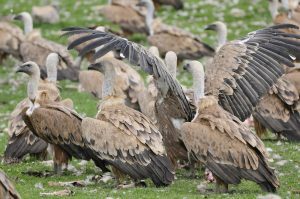 This campaign has achieved its objectives by elevating to 60 the number of breeding pairs in the Lleida plains. From 2012, we build hides to photograph lesser kestrel near the breeding colonies in the Lleida plains and in the breeding area of different pairs of Montagu’s harrier. In return, we collaborate in these species conservation with the Catalan public administration by contributing with material for the annual monitoring and conservation campaign of the species. From the 80s the public administration and public bodies manage different feeding sites for necrophagous birds in the distribution area of these birds. These modern sites wanted to replace the traditional sites where dead livestock used to be thrown away in the Pyrenees and that slowly were disappearing. These sites turned out to be essential for the recovery of species such as vultures and lammergeyer. From the foundation, La Sabina has carried out a tourist management of four of these private feeding sites. This has led to the conservation of these birds and the fund of these sites thanks to the photographic activity. One of this feeding station is of great importance for the Catalan population of Egyptian vulture getting to concentrate more than 60 individuals near the migration season. 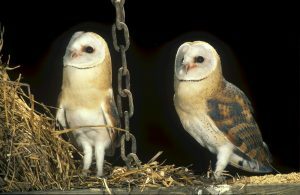 Barn owl is considered Vulnerable in Catalonia and in regression in Europe. Hacking is a technique to help individuals settle in a territory where population has disappeared or been reduced. Chicks are fed in an artificial nest before being released. 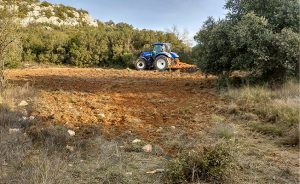 In collaboration with the Fauna Protection Centre of Vallcalent (Generalitat de Catalunya) hackings have been carried out in Montsonís from 2015. Apart from contributing to the repopulation of the species, dissemination of knowledge and problematics of the species is carried out amongst the public. In order to foment the knowledge of our Natural Heritage amongst the generalist public, we have developed some didactic initiatives. 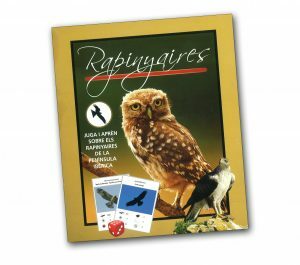 Amongst others, the project «Land of raptors» with a card game called “Raptors” in Catalan language, to raise awareness about the importance of having those. Another project has been the online courses around the Ivars and Vila-sana lake to help the activities carried out by Egrell organisation and the “Consorci de l’Estany d’Ivars I vila-sana” in this nature reserve, to contribute to the dissemination and knowledge of natural values and its conservation.